Someone helpfully shared on the Facebook page that it’s Heroes Week at The Great Escape in Lake George. That means that, through Sunday, “all military personnel, teachers, police officers, fire department, nurses and EMS personnel will receive free admission to The Great Escape when they how occupational identification at our main gate”. Plus, the folks with you will get $10 off. If you click the website, you might notice a typo, but I called to check: this deal is for the rest of the week and the weekend. I’ve never been to The Great Escape. And my children have never asked me to go to The Great Escape. I’m not going to just offer an outing like this, because, as you know: 1) I am cheap, and 2) I hate to drive. I’m sure that if they were aware of such fabulous offerings, they’d ask to go. . . right? At the moment, I’ll hope for continued ignorance, like we’ve maintained about most cable television, Kidz Bop, and Webkinz. Although, the truth is, an amusement park is far more tempting to me than any of those other items. And part of me wonders M knows about it, and she’s just assuming that I’ll reject her requests. She’s fussy like that. The other day we received the Chasing Fireflies Halloween catalog, and M expressed self-righteous outrage at the ridiculous prices of the costumes. Is it that she’s absorbed my aversion to expense? Or is it just bitter disappointment? Because ohhh, they are way too expensive, but they sure are beautiful. Never mind: we’ll be happy enough with something cobbled together with craftiness and Google. Meanwhile, we’ll stay happy enough, for another year or so I think, with Hoffman’s Playland in Latham. This is a lovely “starter” amusement park. J and the girls take a helicopter ride. 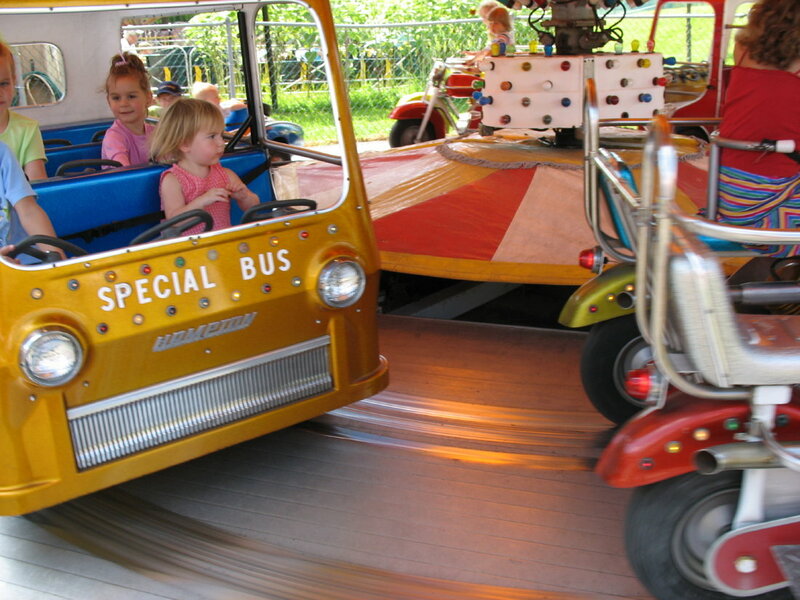 There are a bunch of kiddie rides that even the very young will appreciate: a carousel, a boat ride, a bunch of different vehicles to ride, and, the classic: a choo-choo train that moves through the park. J drives the bus (M chose the firetruck). There are a few “big kid” rides, as well as a small-ish arcade, and space for birthday parties. Last year was the first year that M, at 7, attempted the roller coaster. She’s already begun to scoff at the “baby” rides, but she has fun, anyway. I think kids in the 10-and-over set might just be too sophisticated. Hoffman’s is open from noon-9 pm every day until Labor Day, and after Labor Day they have more limited hours on the weekend and before some schools start. Kiddie rides cost one ticket (for anyone, even if you’re getting on with your nervous toddler), which cost $1.50 each of $27.25 for 25 tickets. So if you’re not sure if kids are going to enjoy it, you can go with a friend and minimize your investment to start out. When it’s time to leave, you can lure the kids out by promising ice cream at the Dairy Freeze just outside the park. They have mini-golf and other activities, too, although we’re usually too exhausted for more than a quick bite before heading home. Anyone ever do the golf or birthday parties here? Love that J is riding the special bus. Also — you should get your costumes at the Pass it On Sale (going on now at the Albany Academy). I scored some AWESOMELY AWESOME costumes/dress up clothes for my boys — a flawless Zurg costume ($5), a dragon ($8) and various other superheroes (and one princess dress)! 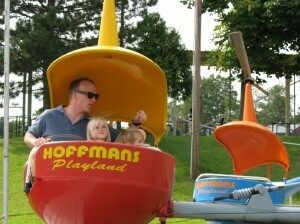 We love Hoffman’s too, and even put my 15 mo with my 4 yo on the boat ride last year. 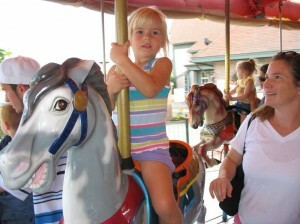 They are cool about a parent riding free with a kid on the carousel, in my experience. Now at 2 and 5, my kids happily ride all the kiddie rides, but the 2 yo cries when they end sometimes.